I have recently joined the website, Secret Recipe Club. It's a group of food bloggers who each get assigned someone else's food blog and have to make one of their recipes. It's a really neat concept and a great way to explore the food blog world. This was my first month doing it and I was assigned the blog Every Little Thing. I was very interested to learn that the blogger, Stacy, is local to St. Louis, a city I lived in for about 3 years myself while I attended grad school and my husband attended seminary. I have fond memories of our time in St. Louis and consider it our home-away-from-home-away-from-home, even though we haven't been able to visit for over three years now. While perusing Stacy's collection of recipes, I found several that I would like to try. Some of them were dishes that I was somewhat familiar with making (like her Mexican Chicken Dip), but in the end I decided to go with a type of dish I have never made before: wings. I like wings, although I don't really eat them very often. But I had been thinking recently about how I would like to try my hand at making them. Stacy's recipe for Asian Zing Wings gave me great inspiration. Stacy's wings looked great, but she did admit in her post that she would have done one thing different. She sauced the wings before baking, and later realized it would be better to sauce them after baking. So I took that suggestion and ran with it. I decided that instead of just baking the wings plain, I would coat them in flour so that they got all crispy before being sauced. I also used a different sauce recipe than Stacy used. I had some wings at a restaurant in Milwaukee earlier this summer called "orange teriyaki wings." They were so good. I wouldn't have thought to combine orange with teriyaki, but it really worked. So I created an orange teriyaki sauce for my wings. Here is the recipe I came up with. Make sure wings are very dry; pat them with paper towels to remove any excess moisture. Place wings, flour, and salt in a large bag or bowl and seal or cover. Shake to coat. Line a baking sheet with foil and place a cooling rack on top. Spray the cooling rack with cooking spray. Remove wings from flour, shaking off excess, and lay out on the cooling rack. Place baking sheet in the fridge and refrigerate for an hour. Preheat oven to 425°. Place baking sheet in oven and bake wings for 40-50 minutes, or until internal temperature reaches 165° and wings are golden brown, turning once halfway through. About ten minutes before wings are done, combine teriyaki sauce, orange juice concentrate, and honey in a small saucepan. Combine cornstarch with a small amount of cold water and stir well. Pour into teriyaki sauce. Turn heat to high and let sauce come up to a boil, then reduce heat to low and simmer until it thickens to desired consistency. Place wings in a large bowl with a lid. Pour sauce over wings, put lid on bowl, and toss to coat. I have to say, these turned out really well. The combination of the super crispy skin and the tangy sweet and salty sauce is amazing. Make sure you use reduced-sodium teriyaki sauce for this, or it will end up too salty. A note about the wingettes: I had never bought wings before, so I didn't really know what I was doing when I went shopping for them. I found "wings", and then I found "wingettes." It was my understanding that the wings would have to be separated before cooking, while the wingettes were already separated. I don't know if that's right or not, but I bought the wingettes. I bought two 2 lb. packages and assumed they contained about the same number of wingettes. Wrong. The first package contained 14 wingettes while the second package contained 21. That's a big difference! I'm assuming that the 14 wingettes were much larger than the 21 since they weighed the same. So you will have to take that into consideration when deciding your cooking time. My wingettes were large, so they took about 50 minutes to cook through. If yours are smaller, they will cook more quickly. Also, when saucing the wings, you might want to reserve some of the sauce, in case you don't need the full batch to cover your wings. It also depends on how saucy you like them. My husband said these wings were way better than anything at Buffalo Wild Wings. I'll take that as a pretty good compliment! The wings right before going into the oven. Refrigerating them for an hour after flouring them ensures a nice crispy exterior. Golden brown and delicious! Right before being sauced. I definitely know what I will be taking to the next Superbowl party I am invited to! I think it would work well to make them as written, and then throw them into a warm slow cooker for parties. Be sure to check out all of the other Secret Recipe Club posts by clicking on the thumbnails below. This is so much fun and I'm really glad I get to participate! These look delicious! I just joined SRC myself this month...such a fun group! Glad they turned out well for you! I didn't have a lot of experience making wings when I made those and my friend Kim sent me the recipe, and I knew I had to try them. I will have to flour mine next time! And so funny you lived in STL. I really enjoy it here! Those wings do look great! I too have never tried making wings at home so thanks for sharing your experience- feel motivated to try now! Great pick for the SRC- glad you joined! Your wings look wonderful, wish I had some right now. 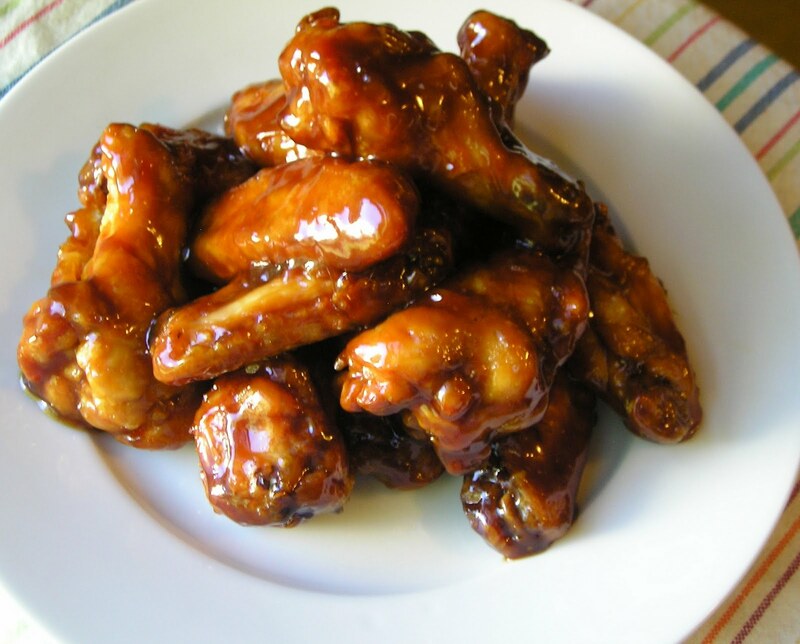 Yum, this crispy baked orange flavored wings are to die for! Welcome to the SRC, hope you'll enjoy it. I love that these are baked, not fried. The orange sounds like a great flavor addition. These look really yummy! We love wings here but don't eat them often either. I have taken them to potlucks before and kept them warm in a crockpot. Works great! These wings look great - and I definitely have to agree with your husband that they look better than anything at Buffalo Wild Wings! It was such a pleasure going through your blog for this month's SRC. I wanted to try everything - and have tons bookmarked for later dates! I love all things citrus and I love finger type foods. This combination sounds perfect! Those wings look delicious. I'm still split on the debate of whether you should add the sauce before baking or grilling, or after (i.e., tossing it in the sauce as you did). From what I've been reading, it looks like tossing does the best job in the end if you want the wings to be crispy. wow Those chicken wings look so great! Have to make them soon. Combining orange chicken and teriyaki?? YES!! Sounds soo delicious! Chicken wings are one of my favorite things to eat and this recipe is the next one I will try! Great picture! The glaze on those wings is phenomenal! I love sticky, gooey, sweet, fruity glazes on chicken and I love teryaki! This one goes in the bookmarks. Awesome SRC choice! I love that you made an orange teriyaki sauce for them... I am partial to a sweet sauce on wings rather than the typical spicy Buffalo sauce. So glad I found this via SRC! I never heard about the refrigerating the wings after they've been floured. Great tip! I have been looking for a recipe to make these with! My son just loves those wings and I can never make them come out right. I will be using this recipe.